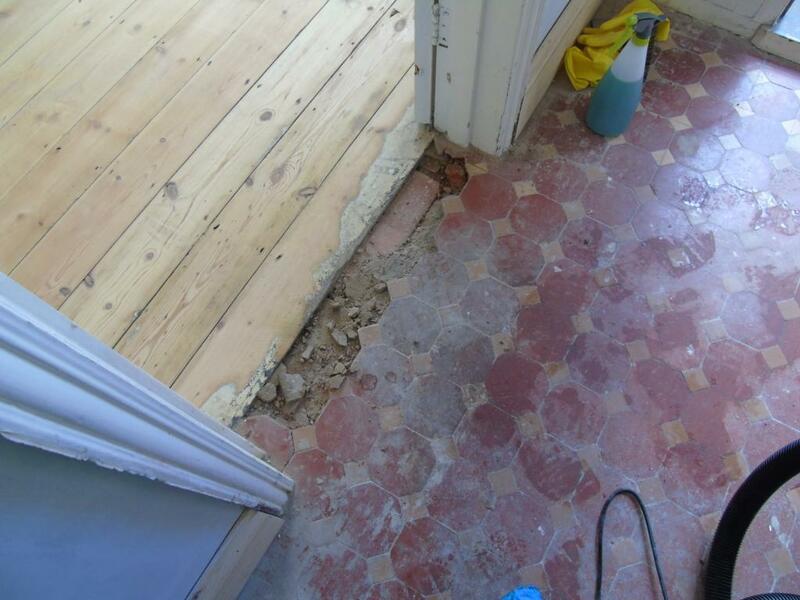 If you’ve even undertaken a property renovation, you’ll know that building works can take a very heavy toll on your floors if not properly protected. 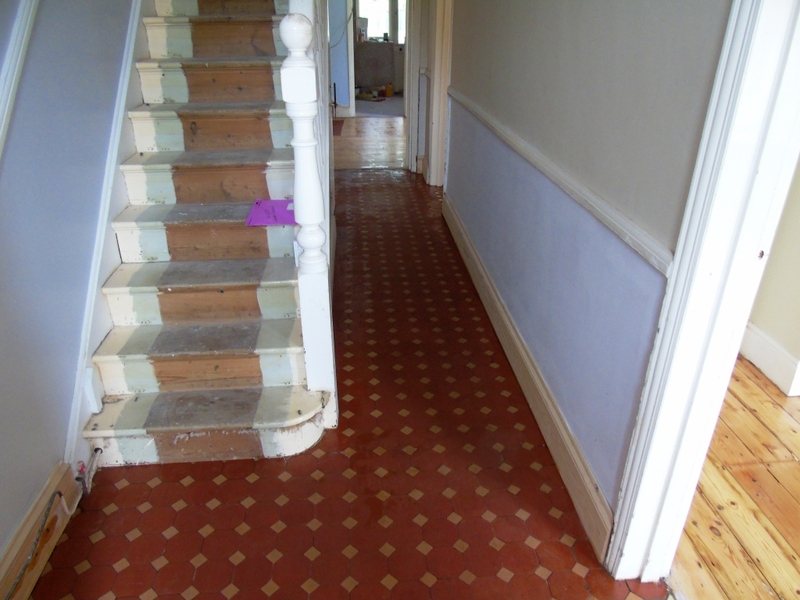 Not too long ago I was called to a house in Gloucester to see what could be done to restore the appearance of the tiles after the Victorian tiled hallway had been left in a sorry state following renovation work. Upon arriving at the property, I also discovered that there was a row of tiles missing under one doorway. These would need to be replaced before any cleaning could take place. The renovation work had left very dirty and riddled with minerals salts and old grout smears. If you have never been Gloucester it’s well worth a visit, dating back to the roman times it is in fact the country’s most inland port boasting some fantastic architecture include the historic docks and many period buildings. Fortunately, I was quickly able to source matching replacements for the missing tiles to not disturb the original character of the floor. I took it upon myself to install these, fixing them in place and then grouting them. While the grout on the new tiles was drying, I began the cleaning process using a strong solution of Tile Doctor Pro-Clean. This is a high alkaline cleaner which we use reliably on most types of natural stone, including Victorian, Quarry, Slate, and Sandstone. The product was mixed with a small amount of water, and the solution was worked into the tiles using a black scrubbing pad fitted to a heavy weight rotary machine. This dealt with most of the thick dirt and staining that had been left over by the builders. The soiled cleaning solution was then rinsed away with water and extracted using a wet vacuum. After the first stage of cleaning, I washed the floor down with Tile Doctor Acid Gel, which is a blend of phosphoric and hydrochloric acid in gel form designed to remove any mineral salts and old grout smears. Once the cleaning process had been completed, I left the floor to dry overnight. 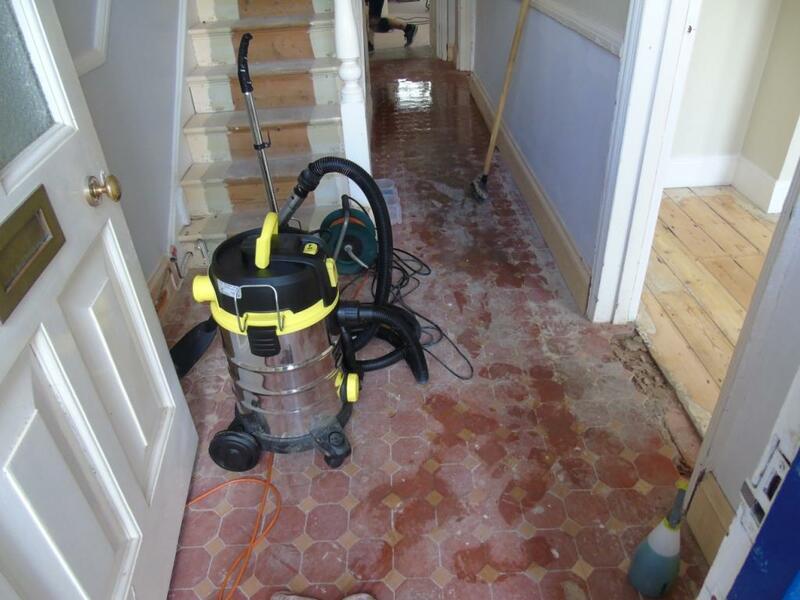 Typically, it’s good to give a tiled floor at least 24 hours to dry in order to ensure no moisture was left over, because even the slightest quantity of moisture can cloud the sealer and damage its performance. Once satisfied that the floor was completely dry I applied one coat of Tile Doctor Colour Grow, which is an impregnating sealer designed to enhance the natural colours in the stone. I then waited an hour this sealer to cure before applying four coats of Tile Doctor Seal and Go which added the satin finish the customer had asked for. The combination of sealers will provide the protection the floor needs and the customer will find it much easier to keep it clean in the future. The result was great and the customer was very happy indeed. 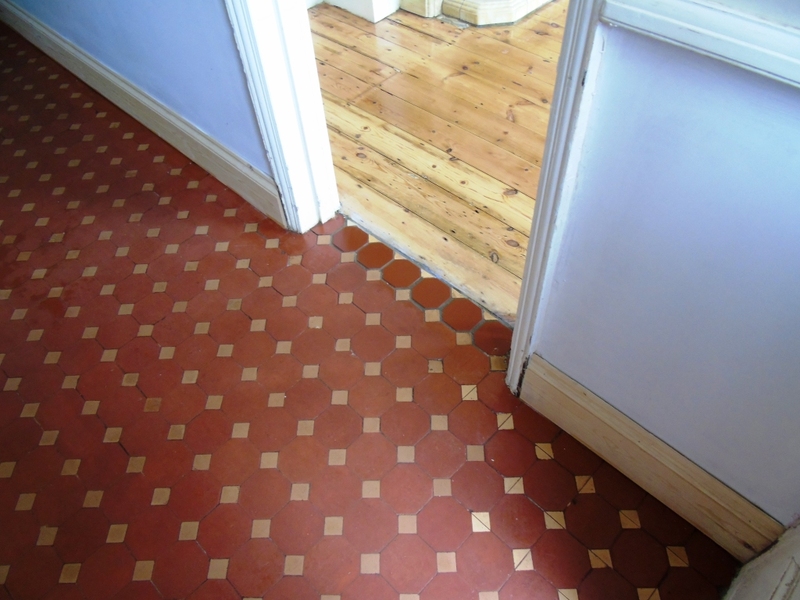 This entry was posted in Victorian Posts and tagged gloucester, hallway, tile cleaning, tile sealing, victorian tiles by AbzDominise. Bookmark the permalink.